Because we could all use some ~jean-ius~ tips to finding denim we actually like wearing! 1. Dissect the anatomy of a ~perfect fit~. Pay attention to whether you have a gap in the back and if they sit slightly above your hip bone. These NYDJ jeans ($52.83+ on Amazon; available in sizes 0-18 and in 24 colors) have 1,060 five-star reviews that r a v e about how they fit! Do people literally say they feel like "a million bucks?" You bet. 2. Learn your denim terms! For example, whiskering is sadly not about a fluffy cat, rather the slight distressing found around front pockets. Check out even more from Madewell's Madewell Musings for all the denim slang you need to know. These Madewell skinny jeans ($135 on Madewell; available in sizes 23-32 and in regular and tall lengths) have *just* enough whiskering for a very subtle distressed feel. 3. Check the fabric makeup for the cotton percentage (the more cotton, the higher the quality) and the elastane percentage (how much stretch the pants give). American Eagle prides themselves on designing jeans that boast comfort without sacrificing quality (hello, 90% cotton). Their Ne(X)t Level Stretch technology offers jegging-like stretch to form to YOUR body and remain comfy all darn day (but only has 2% elastane to avoid over-stretching or bagging). Plus, their LYCRA® DualFX technology lets the jeans snap back to their original shape after all-day wear. And yes, the inside of these jeans *are* super soft! Get them from American Eagle for $49.95 (available in sizes 00 Short–20 Regular). 4. Discover the difference of brands that actually do their research — like Torrid! Every style of their jeans are broken down by rise, inseams, and are designed with Premium Shaping Lycra® technology so they're *fit* for a kween (you). Torrid's Classic Skinny Jeans ($44.17 on Torrid; available in sizes 10-30 in regular, short, tall, X-short, and X-tall) have won over 122 five-star reviewers, all thanks to their impressive stretch, dark wash, and how they run true to size! 5. Understand there really isn't such thing as "universal sizing." A size 12 at Forever 21 might not translate to a size 12 at H&M. So don't look at the tag and just focus on what feels best! Easier said than done, I know. But here's proof! 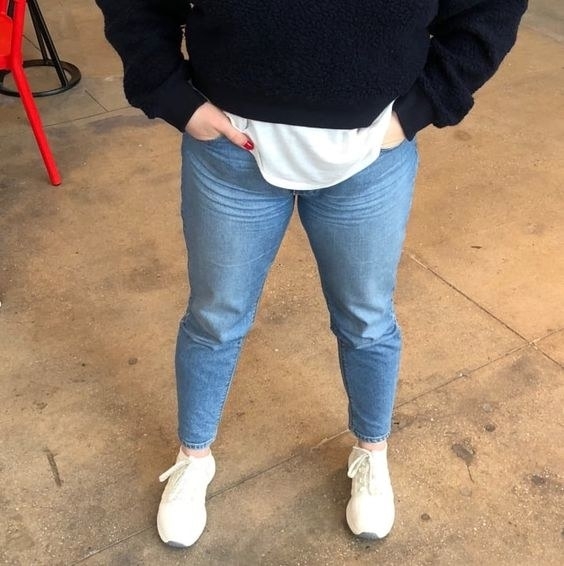 Check out how a BuzzFeeder tested out "her size" at different stores (and was really all of us when alone in dressing rooms). 6. Identify where your jeans should sit based on their rise, or how high they sit. For example, low rise jeans should sit snugly about two inches below your belly button (without a waist gap). Check out more from Stitch Fix for how to find your perfect jeans! Don't know where to start? Here are some suggestions! Levi's 529 Curvy Bootcut Jeans ($39.99+ on Amazon; available in sizes 27-14 plus in short, medium, long and in three colors) sit below the waist and have 1,347 five-star reviews that speak to their fit (especially for women with curvy hips! ), serious comfort, and great quality material! Signature by Levi Strauss & Co. Gold Label Skinny Jeans ($19.99+ on Amazon; available in sizes 4-20 in short, medium, long and in eight colors) sit right above the hipbones and have earned 1,039 five-star reviews for their stretch, perfect fit (aka no riding down or squeezing), and sturdy material! LEE Women's Classic Fit Monroe Straight-Leg Jeans ($19.99+ on Amazon; available in sizes 4-18 in short, medium, long and in 12 colors) rest below the waist rise (middle of your torso) and have earned 1,417 five-star reviews for looking expensive, a comfortable and feel-good fit, and impressively high-quality material! 7. Search for "rigid" jeans (or denim that's high in cotton) if you want as little stretch as possible. Aim for 98% cotton or higher! H&M carries affordable rigid jeans that are also sustainable! These have five pockets, are slightly distressed, and are made partly from recycled cotton. And you guessed it, are made of 98% cotton and only 2% spandex. Get them from H&M for $39.99 (available in sizes 24-36 and in three colors). 8. Do some research before *discounting* inexpensive brands. A lot of cheaper stores, like H&M and Old Navy have tons and tons of glowing reviews for their jeans! Did we already hunt down the best for you? Of course. Check out how five BuzzFeeders tried 24 different jeans. The champion? Old Navy's Mid-Rise Rockstar Super Skinny Jeans. I guess they earned their title, huh? If you need more proof check out the other 864 five-star reviews! They sit just below the waist and are fitted through the hip and thigh (having curves in mind). Plus, they boast unbeatable stretch to form to every body type — all bums, hips, and thighs welcome! Get them from Old Navy for $29 (originally $34.99; available in sizes 0-20 in short, regular, and long). Also available in tall and petite. 9. Pair your height with your needed inseam measurements when shopping for jeans. For example, when it comes to skinny jeans, those 5'6" or taller should look for inseams that are 33"-34" long. Check out more from Stitchfix for a guide to denim inseams. These skinny jeans ($135 on J. Crew; available in sizes 23-32) are highly-rated for running true to size! Not to mention J. Crew goes into detail to make sure you understand each style's inseam measurements and offers a handy denim size chart. 10. Consider doubling up if you find a pair of jeans you just really LOVE. As you're probably aware by now, that doesn't always come easy. So shouldn't the good ones be ~twice as nice~? Check out even more from Madewell's Madewell Musings for all things petite denim. o p t i o n s.
Shop J. Crew's petite jeans section from $98+ (sizes range from 23-32) or check to see if Madewell denim styles are available in "short", like these best-selling high-rise skinny jeans ($79.99; available in sizes 23-32). 11. Select jeggings for denim you plan on wearing with booties. They won't bag over your shoes and will create a look look that won't bunch on the bottom. Check out more from Trendy Curvy for how to style jeggings with booties. Get dark-wash jeggings from Torrid for $56.17 (originally $74.90; available in sizes 10-30 in regular, tall, short, X-tall, and in X-short) that's made from Premium Shaping Lycra to hold stretch and shape all day! 12. Can you wear any style jean you want? OBVIOUSLY. But try out some cuts that are widely-known to comfortably fit! You might just find your ~new favorites~. Check out more from Stitch Fix for how to find your new favorite jeans. And do I have suggestions? Of course. Gap Washwell Mid Rise Classic Straight Jeans ($48 on Gap; available in sizes 24-35 in regular, tall, and petite) are highly-reviewed for their premium stretch denim (91% cotton), vintage-y style (hello, subtle fading and flare), and comfortable fit! Torrid Premium Stretch Boyfriend Jeans ($59.17 on Torrid; available in sizes 10-30 and in regular, tall, short, X-tall, and X-short) have won over reviewers thanks to their relaxed fit, comfortable stretch, and lack of slouching (or bagging). Did I mention their stylish distressing and light wash? Joe's Honey Curvy Bootcut Jeans ($83.07 on Nordstrom; available in sizes 24-33) have earned high marks for their slim bootcut silhouette (specifically designed to hug your curves), higher-end material (hello, 98% cotton), and for running true to size! Free People Just Float On Flare Jeans ($78 on Free People; available in sizes 24-31 and in nine colors) are insanely popular for their super-trendy silhouette, stylish raw hems, and super soft (and stretchy) fabric! Lane Bryant Super Stretch Skinny Ankle Jeans ($89.95 on Lane Bryant; available in sizes 14-28) introduces practical to trendy with its slight distressing and frayed hems. Its mesh tech panel behind the pockets keeps everyone's tummies comfortably snug (goodbye squeezing and gapping) and boasts enough stretch to hug each and every curve (without bagging). 13. Get the most out of the cropped jeans trend by making sure your hems meet just at your ankle. That way your legs don't seem ~cut off~ and are still elongated. Check out even more from Who What Wear for helpful jeans shopping tips. Get these high rise bootcut jeans from Free People for $98 (available in sizes 24-31 and in two colors). 14. Study how some jeans look IRL — or the closest thing to it, at least. Customer photos or our very own reviews can give you a good idea of how certain styles look in the wild! Check out how some BuzzFeeders found jeans they swear by. Get the first pair from American Eagle for $49.95 (available in 00 X-short-20 long and in blue) and the second pair from Mott & Bow for $118 (available in sizes 24-32). 15. Read the store's sizing chart before placing your order! Sizing varies store by store, so you'll want to see how they translate your measurements. Check out even more ways to get clothes online that actually fit. 16. Pay attention to inseam details when shopping for boyfriend jeans. Some stores will even feature different sized models and list their inseams so you can compare your own fit! Check out more from Stitch Fix for how to find your inseam. Everlane The Modern Boyfriend Jeans ($68 on Everlane; available in sizes 24-33 and in four colors) have almost 1,218 positive reviews for their relaxed fit. They sits at your mid-waist and should fall straight at the ankle. Their high-quality material (98% cotton) ensures long-lasting wear without bagging but still have a *touch* of stretch for comfort. Check the different models to see what inseams they wear! An added bonus? Everlane includes style notes based on how their employees wear their jeans in the office! They noticed women liked to wear this style two ways: one size down and higher on the waist, or in their true size for a slouchier fit. 17. Sneak a peek at the back, too! A good fitting jean will accentuate all your curves. Get these skinny jeans with heart-detailed back pockets (and plenty of stretch to hug your curves) from ModCloth for $44.99 (originally $69; available in sizes XXS-4X). 18. Consider collections designed to be ~size inclusive~ to increase your chances of finding a "true fit." Brands like NYDJ offer denim technology to fit sizes 00-28! Check out even more to see how four different BuzzFeeders tested out size-inclusive jeans. Shop the NYDJ 360 Curve collection from Nordstrom for $79.73+. 19. Don't worry about the length of the pants if everything else fits well. All you need to do is some DIY cropping in a few easy steps! Tldr: fold cuff to desired length, mark cut-line, and snip snip. What you'll need: fabric scissors ($10.24 on Amazon), measuring tape ($5.99 on Amazon), tailor's chalk ($4.99 on Amazon). Check out more from Levi's Off The Cuff for the full tutorial! 20. Research before hopping on the trendy brand wagon. A lot of jeans come and go, but only *some* earn their keep (and justify their price tag). MOTHER denim combines on-trend designs with premium denim, earning a cult following. So they can stay. These MOTHER frayed ankle skinny jeans ($210 on Nordstrom; available in sizes 24-32) have earned lots of positive reviews for their approachable street style (hello, frayed hems), soft inner material, subtle stretch, and of course investment-worthy denim. So go ahead, your bum will thank you and card will understand. 21. Explore colored jeans without leaving your comfort zone. Warm hues like maroon have the same visual effects as a dark wash, so the only thing truly new is the influx of compliments. Get them from Old Navy for $47 (originally $49.99; available in sizes 16-30). Also available in straight sizes for $30 (originally $34.99; available in sizes 0-20). 22. Keep stores like Target in mind for adaptive denim. They're designed specifically for ease of dressing, have a hidden opening for abdominal access, and are sensory-and-wheelchair-friendly! Win, win, win. They have high rise for diaper coverage and have flattened seams help reduce pressure points. Not to mention they don't have any pocket bags, coin pockets, back pockets, or rivets for fuss-free wear. Did I mention they're 91% cotton and have 65% recycled polyester? Get them from Target for $27.99 (available in sizes 00 short-18 long). Also available in plus for $29.99 (available in sizes 14W-24W). 23. Try jeans with a fun hem if you're looking for a *unique* new style, but don't want to splurge on denim that won't stay in style forever. Get these flared jeans from Anthropologie for $138 (available in sizes 24-32). 24. Opt for inexpensive brands like Forever 21 for trendier looks. If you don't know how long you'll want to wear them (aka five years down the road), they're probably not splurge-worthy. Promising review: "I love these jeans! They are so comfortable and kept it's shape all day. Nice stretchy material but not to much. Wish they came in different colors." —Tina M.
Get them from Forever 21 for $29.90 (available in sizes 12-20). 25. Throw out the notion you can't wear white jeans all year. When styled (à la below), they are perfectly cold weather appropriate. Sorry grandma. Check out more from Trendy Curvy for how to rock white jeans all year. That being said, you *can* choose white pants that are slightly more eggshell colored (aka not as bright). This isn't to follow an outdated rule, just that this toned-down shade will probably match your winter clothes better (think about it: winter = usually darker shades). Get a pair df white skinny jeans from Simply Be for $16.49 (available in sizes 8-28 and in five colors). 26. Read the inseam details when shopping for cropped jeans. A good trick: see if the store lists the size, rise, and inseam (i.e. size 27, rise 12, inseam 28.25) so you have something to base your own measurements on! Check out even more from Stitch Fix for an in-depth guide to denim inseams. These cropped jeans ($59.99 on ModCloth; available in sizes XXS-4X) are made of 99% cotton! That is some high quality. Plus, their adorable floral embroidery certainly doesn't hurt. 27. See if the jeans' description mentions the fabric's "recovery" ability. That'll tell you if those jeans can snap back at the end of the day. Do you basically wear the same jeans every day (hello, me)? Then this is important — they need to be ready for action come morning! Check out even more from Madewell's Madewell Musings for more handy denim terminology. Madewell's Spring 2018 line all boast denim technology that's ready to bounce back even after daily wear! For example, these best-selling high-rise jeans ($98 on Madewell; available in sizes 23-35 in regular, short, and tall) have 100% cotton — aka as premium as denim can get. They're meant for you to break in so they conform to YOUR body — and stay that way. Custom fit? Pretty sure this is it. 28. Measure a pair you already own (preferably your favorite pair) for a general idea of what best fits already. Check out even more from Advice From A Twenty Something for great jeans shopping tips. Get a measuring tape from Amazon for $5.99. 29. Reap the benefits of premium denim without the heft price tag. Everlane prides itself on high-quality denim (we're talking 98% cotton) but keeps the price tag under $100. Plus they're ethically sourced! Their jeans are made from 98% recycled water and are 85% air-dried! AND *all* of their jeans have earned hundreds and hundreds of five-star reviews, thanks to the seriously in-depth description each design gets. All the information you could want is at your disposal. I guess you could call them overachievers, but we love it! Get them from Everlane: the first pair for $78 (available in sizes 24-33 and in four colors) and the second pair for $68 (available in sizes 24-33 and in three colors). 30. Conquer the infamous all-denim look by pairing the two staples with a pop of color. It'll break all that blue up and add an interesting element! Check out more from Song of Style for how Aimee styles her all-denim look. Get a similar pair of jeans from Nordstrom for $69.99 (originally $115; available in sizes 23-32) and a similar jean jacket from Nordstrom for $90 (available in sizes 2-14 and in three colors). 31. Measure yourself to get the dimensions you'll need to keep in mind while reading sizing charts. Knowing your personal measurements will make translating all of those different store fit guides actually doable. Lucky for us, NYDJ actually has an entire "Fit Finter" with guides to measuring yourself. 32. Stick to fade-resistant black jeans so you don't need to buy yet another pair of black pants come next season. Brands like Gap use technology to make sure your jeans stay intensely black wash after wash.
Get them from Gap for $49 (originally $69.95; available in sizes 24-35 in regular, tall, and petite). 33. Compare your own measurements to a store's inseam descriptions for bootcut and flares — these tend to run a little long so it's important to find a close match! Check out even more from Stitch Fix for how to pick jeans based on your inseams. Express has both boot cut jeans and "barely bootcut" jeans if you only want a *slight* flare! Luckily, their jeans have a good reputation for running true to size! 34. Caring properly for your jeans means helping them last! A truly good pair of jeans has the potential to last forever — which actually depends on you washing them *less*. Washing them as little as possible helps avoid shrinking them! When you do really need to clean them, turn the jeans inside-out and wash them alone in cold water and line dry. High maintenance, aren't they? Check out more from Levi's for how to properly care for your jeans!